Chinese scientists released this image of a cotton plant germinating in its tank on the moon’s far side aboard the Chang'e 4 lander. The photograph was taken Jan. 7, 2019. The moon is a lifeless world once again. 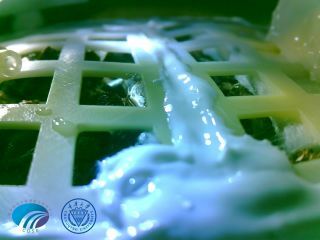 The cotton plants that sprouted on the moon's far side aboard China's Chang'e 4 lander are dead, done in by the bitter cold of the lengthy lunar night, GBTimes reported today (Jan. 16). The experiment — which began just hours after the historic touchdown inside the far side's 115-mile-wide (186 kilometers) Von Kármán Crater — aimed to assess how plants and animals grow and develop in the alien lunar environment. The moon's surface features low gravity, high radiation levels and extreme temperature swings. "Liu Hanlong, head of the experiment at Chongqing University, said at a Chongqing government press conference on Tuesday that the temperature inside the 1-liter-capacity canister had reached minus 52 degrees Celsius [minus 62 degrees Fahrenheit] and the experiment had ended" after 212.75 hours, Andrew Jones wrote in the GBTimes story. The dead plants will rot after day breaks over Von Kármán late this month. But the canister is an enclosed system, so the decaying material will not leak onto the lunar surface, Chinese space officials said. An image of the biology-experiment canister that’s now on the far side of the moon aboard China’s Chang'e 4 lander. Though Chang'e 4 team members have touted the biological experiment's potential to help pave the way for future lunar settlement, it isn't a core scientific payload for the mission. In 2015, Chinese space officials asked students around the country to submit ideas for a payload to fly aboard Chang'e 4. The minibiosphere was the winning entrant out of more than 250 proposals, according to China's state-run Xinhua news agency. The Chang'e 4 lander and rover are gathering detailed data about the surface and near subsurface of Von Kármán Crater. This information is relayed back to Earth via a satellite called Queqiao, which China launched to a gravitationally stable spot beyond the moon in May 2018. Chang'e 4 is part of China's ambitious program of robotic lunar exploration. The nation launched the Chang'e 1 and Chang'e 2 moon orbiters in 2007 and 2010, respectively, and put the Chang'e 3 lander-rover pair on the lunar near side in December 2013. If all goes according to plan, China will launch the Chang'e 5 sample-return mission sometime this year. The cotton seeds are not the first plants ever to sprout off Earth. Astronauts have tended a variety of minigardens in Earth orbit, aboard Russia's Mir space station, the International Space Station and China's Tiangong-2 space lab.